Since ancient times, the young started jointlife, passing a wedding in the church. Standing in front of the holy images, they made a promise to keep their marriage consecrated by God's blessing. They swore eternal love and fidelity, in a unanimous decision to raise future children according to Christian precepts. Today, the bride and groom arrive at the wedding ceremony onwill. They can register their marriage at the registry office, and may decide to sanctify him in the temple. This decision depends on how seriously and deeply understand the family's sense of the bride and groom. After all, the Church allows only one marriage. 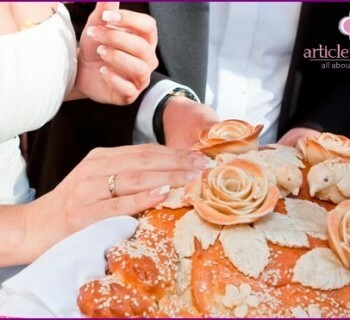 What should be done if you decide to goOrthodox wedding in a church? To begin, select the temple where your wedding will take place. Start training for about three weeks before the expected date. In the church talk to the priest to find out the procedure and the rules of the Sacraments, the ability to take photos and videos, as not all churches are allowed. Wedding candles and white linen - a symbol of purity, light and joy, which gave God's blessing of a new Christian family. Before the wedding in the church, the bride and groomyou must go through purification rituals: fasting and prayers for a few days. Then, confess and partake of the Holy Mysteries. The priest is required to tell you in the first meeting, what prayers to read and what to abstain during Lent. The ceremony requires the presence of witnesses. During the wedding, they will keep their heads above the bridal crowns. Crowns are heavy, and they can not let go. Allowed only to change the hand holding the crown. Witnesses must be baptized and wear a cross. There are requirements in addition to the bridewedding in the church. Take care of the cape, if the dress is too open, and headdress. This may be a veil, but not very lush, as in the hands of you will have lighted candles. Makeup - unobtrusive, and ornaments - to a minimum. But the person has to be open to God and groom. Before the wedding blessing of young parents. If for some reason they do not, select the planted father and mother. They have to be married, but not necessarily with each other. Orthodox wedding in the church committedin the following way. The priest comes to the young through the royal doors and blesses them three times. Then, with the reading of prayers, he takes the bride and groom lit candles and holding the engagement ceremony. He wears a ring to the groom first, then the bride and three changing his them. After that the young are at the center of the temple, before thelectern, and are on a white towel. Before God and the church ask the priest about the sincerity of their desire to create a new Christian family, and waiting for their response. Then, take out beautifully decorated with wreaths, and hoisting them over the heads of the newlyweds. Wedding in the Church continues offering bowlwine - a symbol of life with all the sorrows and joys, which, from this moment the young should be held together, hand in hand. By drinking from the cup three times, the bride and groom, followed by the priest, and three times bypass around the lectern, as a symbol of following church. At the end of the ceremony, the bride and groom are applied to the icons. The priest says the pep talk, and offers congratulations to the young relatives and friends.